Jack “Soldier” Kelly (Lamas) - not to mention Torchy (Palillo) - are back in this second installment for some more snake eating. This time around, Soldier’s rogue ways get him in a whole heap o’ trouble: while still on probation from the antics in the previous film, he takes down some baddies in an unauthorized raid, in his own inimitable style: with guns and grenades. Now in trouble with the law, his lawyer’s only move to prevent Soldier from going to the big house is to label him as insane and send him to the nut house. While in said loony bin, he reconnects with the aforementioned Torchy, as well as making some new, mentally challenged friends, such as Sidney (Aitkin) and Goliath (Scherer). Also Soldier finds time to hit on his shrink, Dr. Pierce (Scarabelli). Meanwhile, street thugs are passing around a new drug laced with poison, and two mob families, the Fabrinis and the Francos, are battling it out for supremacy. 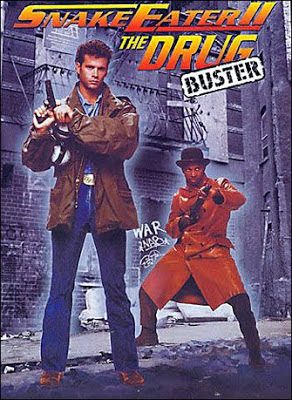 While Soldier sneaks out and teams up with his buddy Speedboat (Scott) to right the wrongs of the streets, cops Broderick and Forester (Brennan and Kinmont, respectively) are conducting their own investigation. Will Soldier and Speedboat prove their sanity once and for all? 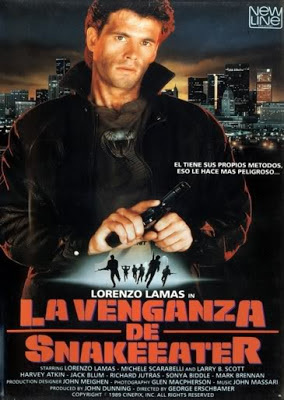 It’s One Flew Over the Snake Eater’s Nest as Lorenzo Lamas once again tries to shirtlessly work through life’s conflicts. If you ever wished the first Snake Eater film wasn’t Dream Team (1989)-y enough, your strange prayers have been answered. But that’s just the thing about this movie. For the most part, it has a goofy, jokey vibe that doesn’t always mix well with whatever action may be occurring. It’s like stirring some Metamucil in a glass of water, but instead of cohesively gelling, it remains a bunch of chunks. Not that we would know from personal experience. The noticeable and disappointing lack of action, or lacktion, kind of puts this into the category of the comedy-based buddy cop movies with a “sassy black guy” that have been churned out since time immemorial. The first movie had the boatercycle, and this movie has Speedboat. As long as there’s some kind of boat, surely director Erschbamer is satisfied. Though it is nice to see Soldier Kelly in a more urban environment when he’s not cooped up in the asylum. The problem is, the movie doesn’t concentrate on the right things. What should be happening is, he should be attacking the mobsters throughout the whole film, on the streets, either with or without Speedboat’s help. Instead, there’s a ton of filler with wheelchair races and all the rest of it. But Kelly and Speedboat do get to parade around the streets (of Canada) in a variety of different outfits. That wasn’t enough to make us love the movie, however. As far as the rest of the cast is concerned, Kathleen Kinmont is (barely) involved, because Lamas apparently can’t make a movie without her. A pleasant surprise was George Buza as the heavy Rico. Though he appeared in Busted Up (1986) as Captain Hook, we had completely forgotten about him. But he was great in both the movies we’ve seen him in, and he really shined as the intimidating baddie with a knack for casual racism. The wonderfulness of 1989 is evident once again, and it’s a testament to the power of video stores that there are THREE Snake Eater movies. ‘89 was such a banner year for video stores and their product, we’re still sorting through it all today. SE2 was just one of a many myriad choices in your local video store’s action section. Now with hindsight, we can look back and examine what that mysterious section was all about. That’s pretty much the point of our site, really. Lamas fans will be onboard with this outing, as will fans of relatively lightweight action, but its lack of seriousness may not sit well with some viewers. Also check out a review by our buddies Explosive Action and DTVC! Thanks! We stumbled upon it...it was hard to get at first. Definitely agree with you. Snakeeater 2 is too silly...not enough sweet Lamas action like Bounty Tracker. I liked the goofiness of this film, that's what made it so fun, yeah there could've been more action and less stuff at the nut house, but i'll still gladly watch this over the dull as dirt Swordsman films any day of the week. Agree once more, it just needed more action and energy. The movie stops when it gets to the nut house.